In keeping with our policy of recognizing user requirements we have introduced the V6000 HDD Max, a state-of-the-art conveyor degausser designed for the volume erasure of hard drives. The specially designed high intensity coils ensure complete erasure of hard drives in large quantities, perfect for IT logistic and security providers. 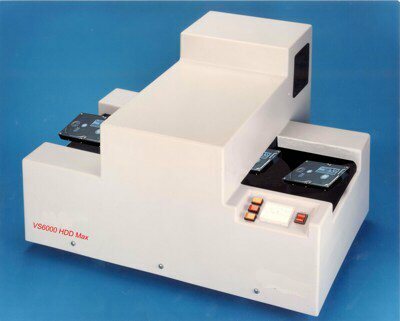 The performance of the V6000 HDD Max will satisfy requirements for large volumes of hard disk drives to be erased. Hard drives are placed on the belt and guided through the 7260 gauss erasure field. The V6000HDD Max regulates temperature to eliminate excessive heating of the hard drive casing. Up to 60 - 70 hard drives can be erased per hour. Note: Hard drives DO NOT need to be disassembled prior to degaussing on the V6000. After degaussing, hard drives (and some media) are not reusable.